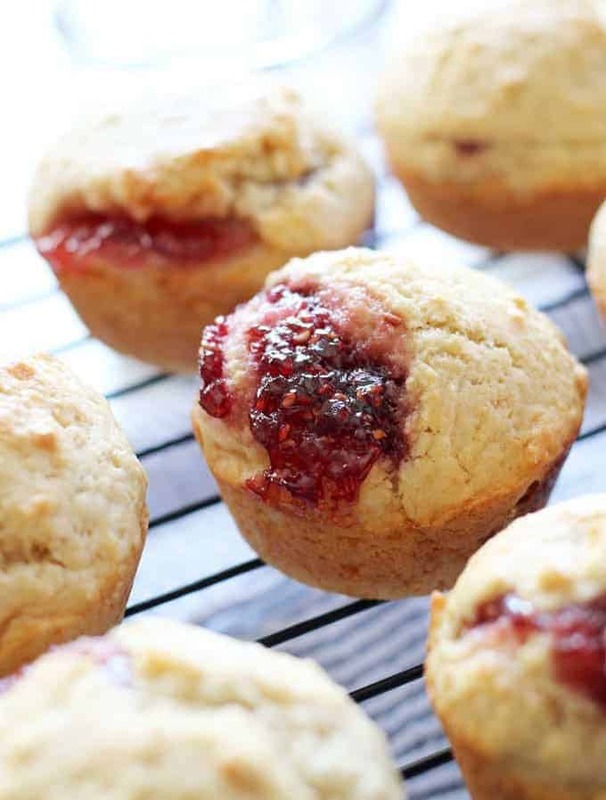 These easy muffins filled with jam are the perfect quick breakfast! I like to eat one or two in the morning with a piping hot cup of coffee. It’s such an easy recipe to make that you can make a batch when you wake up. Also, they are perfect for farmer’s market preserves and jams! There is something to be said for easy breakfasts. 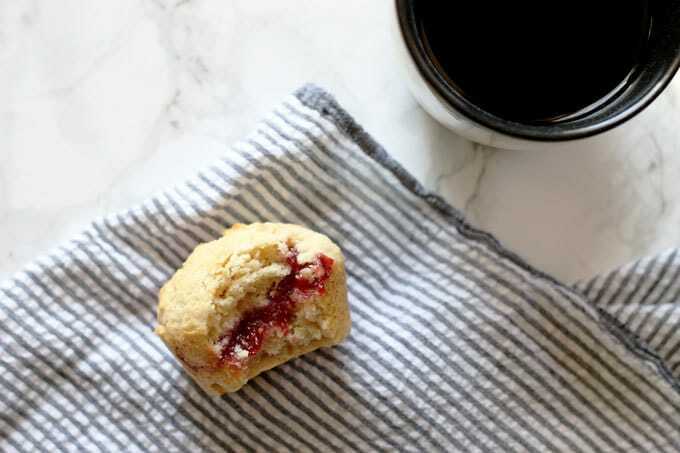 A hot cup of coffee and a muffin, filled with jam, sounds like heaven to me. Even when it’s 90 degrees outside. I believe everyone needs a go-to muffin recipe and when you see how easy these muffins are to make, you will find yourself making these buttery muffins often. 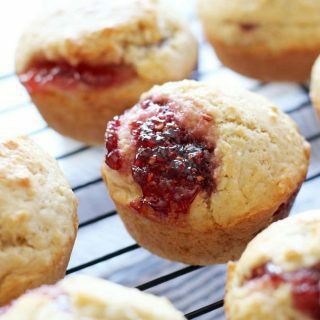 I love that I can wake up and make a batch of these muffins – they finish just after my coffee finishes brewing. 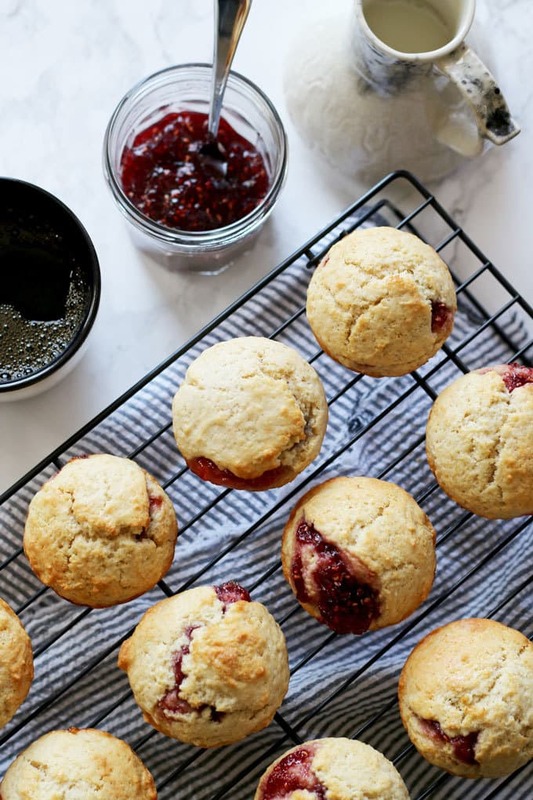 When making these easy muffins, there is no need for a stand mixer or hand mixer – just grab a whisk and a good wooden spoon. Mix the dry ingredients in a big bowl and the wet ingredients in a small bowl. Bonus: melted butter. There is no need to let your butter soften so if you are one of those people who always forgets (like me!) you are going to find this step a blessing. Pour the wet ingredients into the dry and mix until the dry mix is wet. 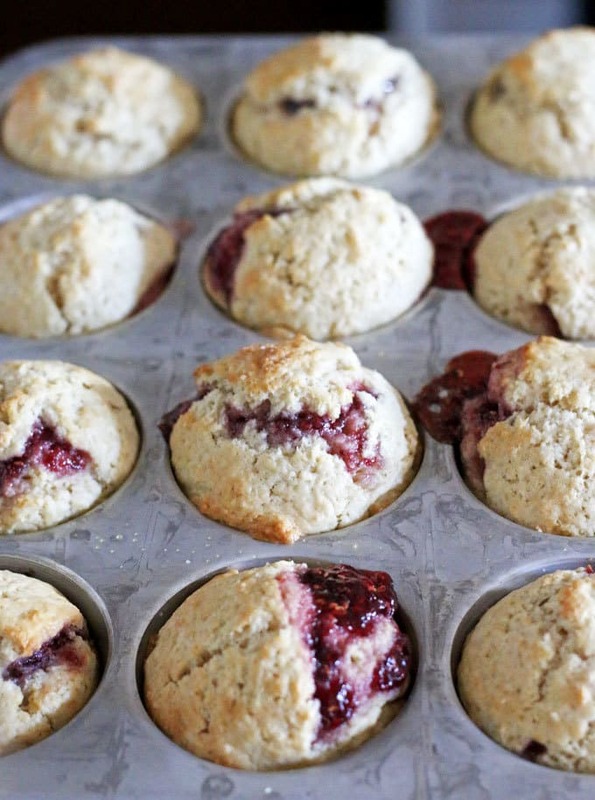 Spoon half of the batter into your muffin pan and then spoon some preserves or jam on top. Can I use jelly instead of jam? I don’t recommend using jelly – we tried that and while it still tasted good it just kind of sank. I keep seeing all of these amazing jams at the weekend farmer’s market – they’re all yelling at me to put them in my morning muffins. 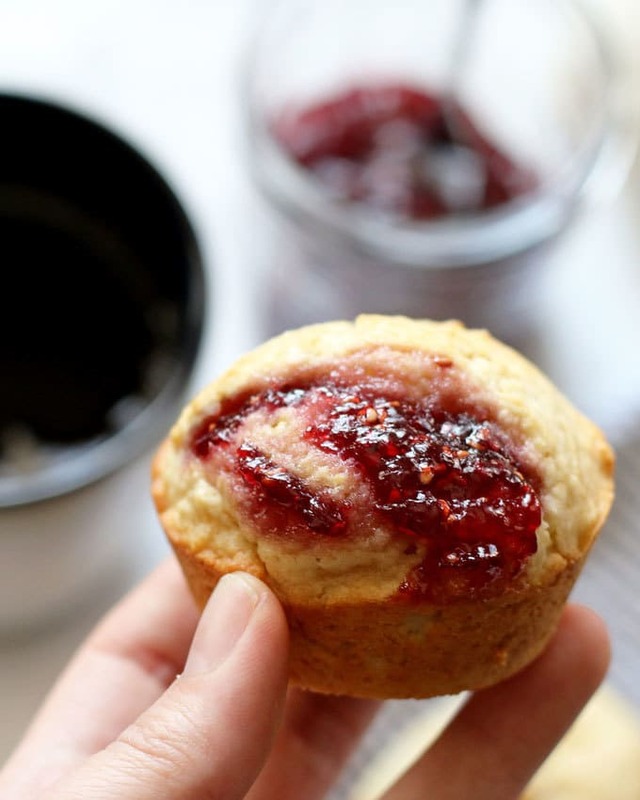 I want a jammy vein through the center of the muffin and I want it to feel like you have uncovered a surprise inside. If you spoon your preserves on top of the batter and it’s not completely centered, that’s okay. Same thing with the rest of the dough. I am a perfectionist normally, and even more so when I’m baking, but this recipe just begs you to let go. The last thing you want is to be worrying about is your muffins, right? Towards the end of your cooking time, check on the oven and your muffins. Use a toothpick to check to see if they are done – if you overcook them, they will not be as tasty. If there are leftovers, store them in a covered container or storage bag. I highly doubt there will be leftovers, however. Fill the muffin-pan cups one-third full with batter. Drop a teaspoon of preserves on top of the batter. Top with the remaining batter. Bake until a toothpick inserted in the center of the muffin comes out clean, 20-25 minutes. Allow to cool for 1 minute, then remove muffins from pan. Allow to cool on a wire rack. Store leftovers in a sealable container. 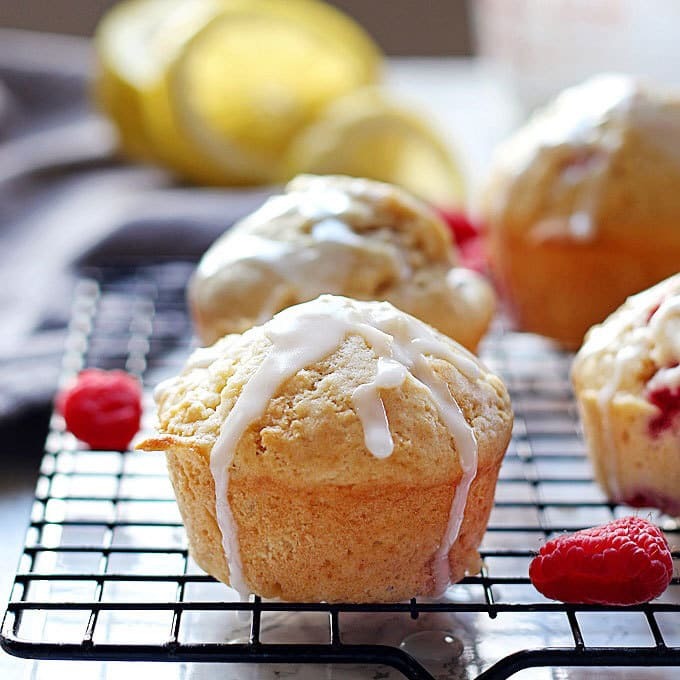 Try my raspberry lemon muffins! These are seriously gorgeous gorgeous muffins. This is the perfect breakfast. 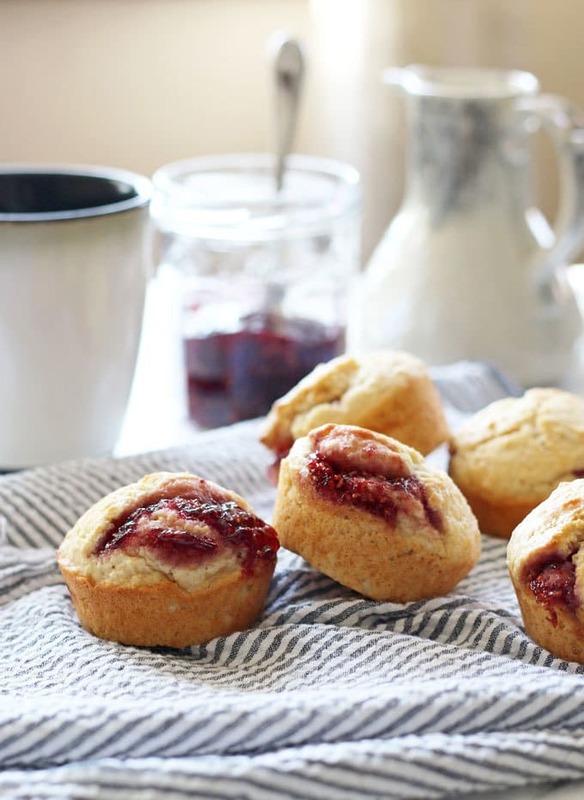 Simple, delicious and allows you to use any jam you want – perfect! Oh! I have to make these my go-to muffins since they look so fabulous! Thanks for sharing a great treat like this! These sound delicious, and I think the jam looks perfect! They definitely look like the perfect accompaniment to coffee. Awesome! I would love one or two of these for breakfast! I don’t think I would have any problem devouring a batch of these for breakfast! I’m afraid those would not last long at my house!! The look so good! Thanks for sharing on the What’s for Dinner link up and don’t forget to leave a comment at the party – Next weeks features that also leave a comment get pinned and tweeted! These would be so versatile! And they’re pretty, too! I see you have other muffin recipes as well. I find them great as a mom to be an easy breakfast i can make the night before for my family. Thanks for sharing on Family Joy Blog Link-up. Please come back and join us again! I’m going to pin this to my personal board too. These look so delicious! They’d be perfect for a brunch! Thanks so much for sharing with us at Share The Wealth Sunday! They can! Make sure they are completely cool, then wrap the muffins securely in foil or freezer wrap, or place them in freezer bags. These really ARE filled with jam! They look SOOO appealing! Thanks for sharing with us at Throwback Thursday! These were pretty good, I liked that they are simple and easy. I misread the instructions and just took a spoonful of jam and pressed it into the centers. (It worked ok but left little caves-no biggie.) These might also benefit from a little lemon zest!!! !